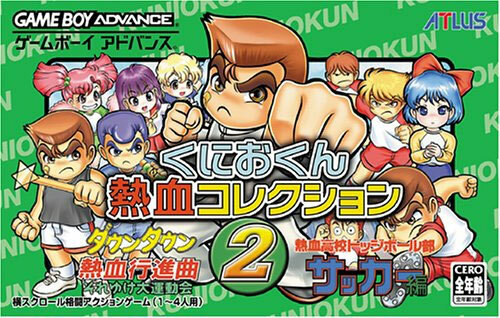 Compilation of two more Kunio Kun games: Sports Day and Soccer. Sports Day has track & field events spiced up by the ability to throw punches, bottles and even bowling balls during your rivals attempts. Soccer allows players to enjoy the fierce rivalry of rather over competitive football between Japanese high school teams. Similar to the Neo Geo classic Soccer Brawl in terms of the violent challenges possible. 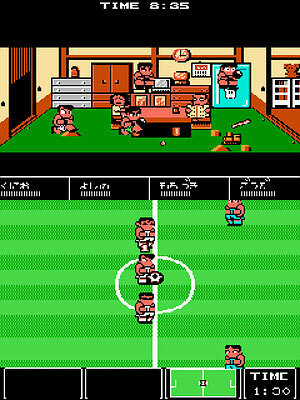 Pretty difficult to track down as the games star and biker gang look-a-like Kunio Kun has a strong following in Japan. Second hand. Couple of very slight manual cover impressions. Very slight wear on one side flap where it has been opened.